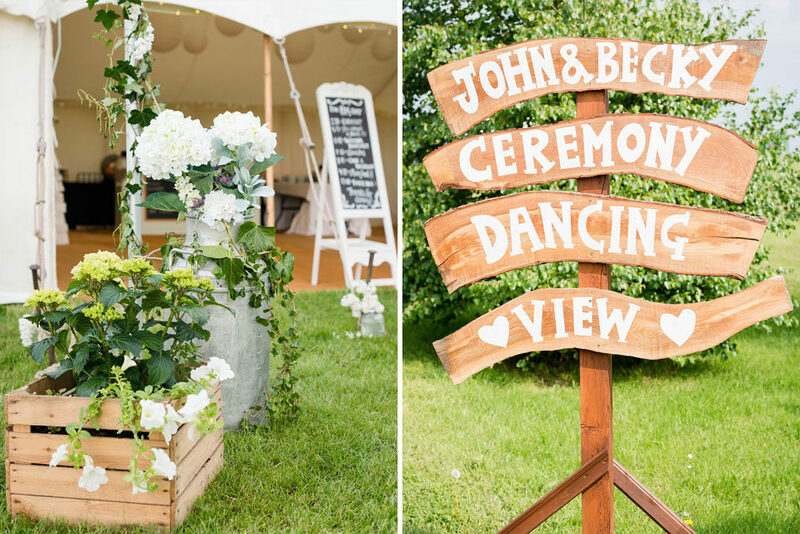 Rebecca & John’s crisp white and greenery filled marquee wedding is utterly charming in every way. Granted it’s making me miss summer already, but it’s nothing a look at the beautiful blooms, fabulous decor and stunning fashion hasn’t cured. 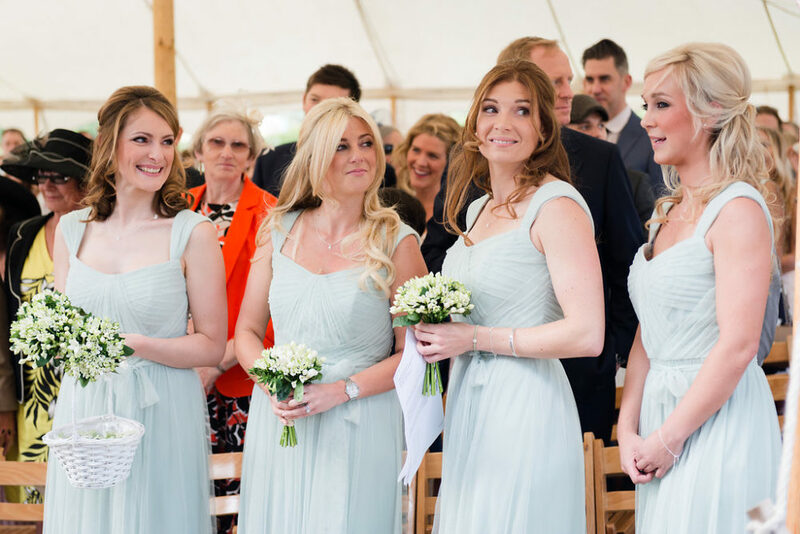 Rebecca wears the most beautiful lace, long sleeved Mori Lee gown with illusion back that is truly exquisite, and the colour of the bridesmaids Dessy gowns compliments The Devon Doorway pub beautifully. With so many more details and emotions captured by Turner and Moss you’ll be itching to pin and recreate too. Rebecca the Bride: I always wanted long lace sleeves. 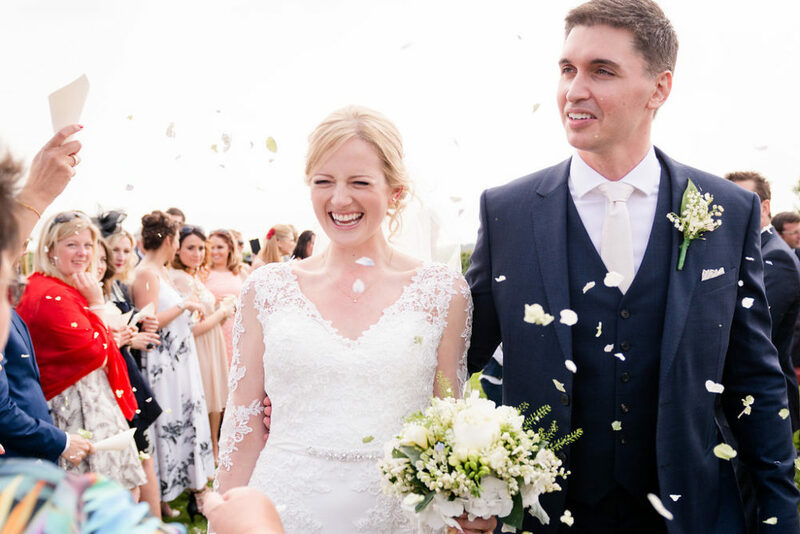 My mum and best friend Louise had me try on lots of styles in the first shop then we went to Bellisima Brides – a beautiful boutique in Brimstage Manor on the Wirral, and found the exact style I was looking for by Mori Lee. For The Groom and Father of the Bride we bought the suits from Reiss. A lovely light summer fabric in Navy blue. With 7 ushers spread across the country we decided that asking the grooms to wear their owns suits would be the easiest option. We gave each of the groomsmen a champagne coloured tie and pocket square from Hawes and Curtis, personalised initial cufflinks from Not on the High Street and shirts from TM Lewin. Church Farm is the most beautiful understated venue. Located next to where I kept my horse growing up, this farm has stunning views over the Dee Estuary, and better still there is a licensed “Lavender Shed” where we could officially get married. On top of all that, one of the real attractions was that it’s a complete blank canvas and Steve the farmer (owner) gave us free rein to choose our own suppliers. Having said that, he was extremely helpful in recommending suppliers and making suggestions – he really cared about our day going well. We hired a traditional pole tent from Posh frocks and Wellies together with an undressed marquee as a plan B for the weather in case we need shelter for the ceremony. I had always wanted an open air ceremony however with pouring rain the day before the wedding, plan B it was. In the end we had beautiful weather which meant we could take all the sides off and everyone could see the view. 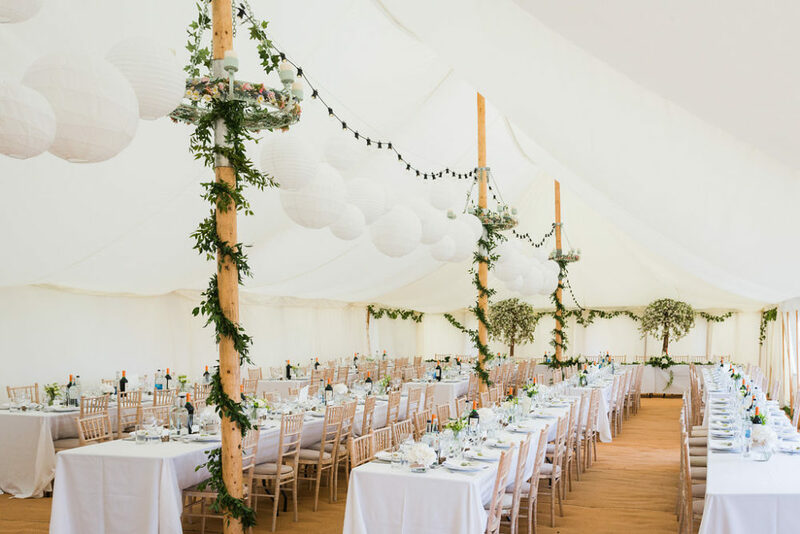 The team at Posh frocks were so helpful and were able to provide the whole kit, from generator to toilets and they even decorated the marquee with gorgeous white lanterns. 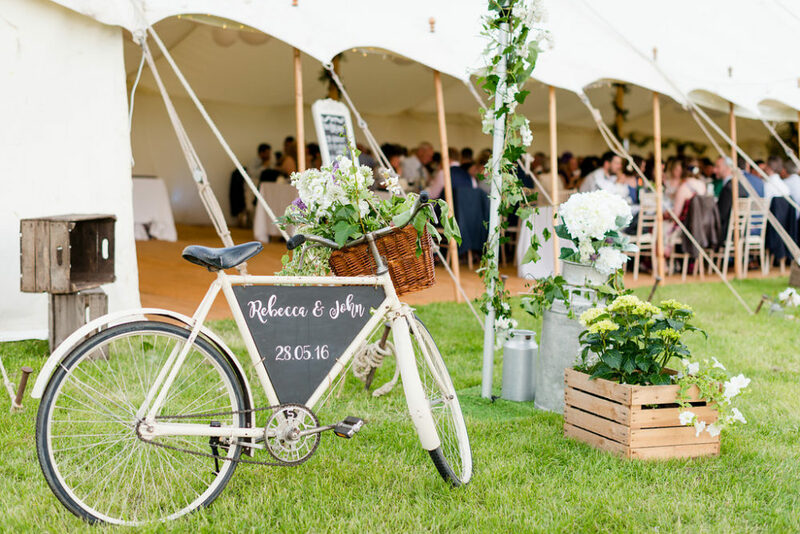 We hired additional props from Sweet Pea and Ivy including a bicycle, milk churns and festoon lighting which really brought the theme together. I also did a lot of DIY; I bought chalkboards, lanterns, and other trinkets! Not to mention my Dad’s woodwork skills making some amazing signs for the venue. There was a lot to do on the day before the wedding however I had the help of my wonderful friends and family. Our flowers were put together with such love and care by the team at Earth Flowers. We went all out with garland flowers wrapped around pillars on the lavender shed – just stunning! 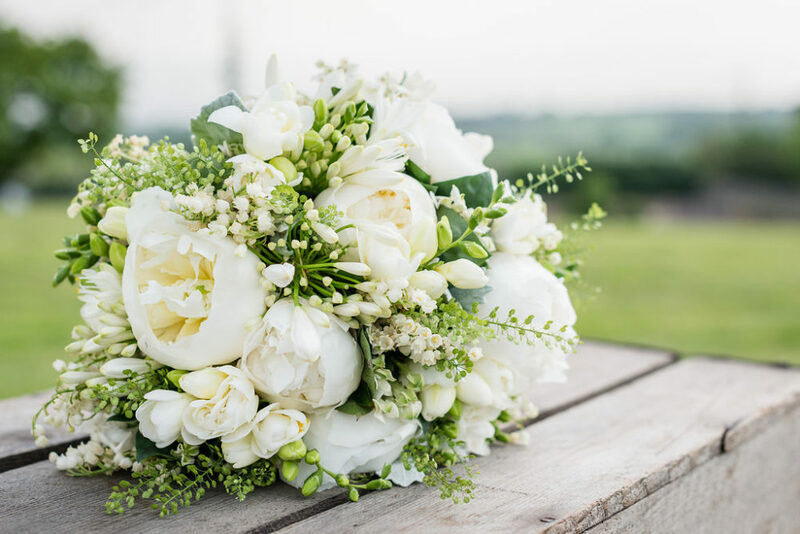 The theme was lots of white and green foliage and I couldn’t resist including Lily of the valley – one of my favourites – so delicate and pretty but expensive so we saved this for the bride and grooms flowers only. I wanted an abundance of flowers and greenery around the venue and my mum raided the garden centre months before the wedding and grew lots of white flowers to fill apple crates. I also hired some large white cherry blossom trees. The gorgeous girls came to London for dress shopping and despite all the bubbles we managed to pick a dress that looked gorgeous on them all (not difficult!). A tulle dress in a beautiful sage green colour by Dessy. They all looked absolutely stunning! I ordered them from Bellisima Brides together with a gorgeous flower girl dress for my beautiful god daughter Lucia, also from Dessy – ivory with a sage green ribbon to match the bridesmaid dresses. Our handsome ring bearer, Theo wore trousers and waistcoat from Next and a cute bow tie from Dessy. They looked adorable and we couldn’t believe how perfect they were at the ceremony. They both loved it and made the day so special. 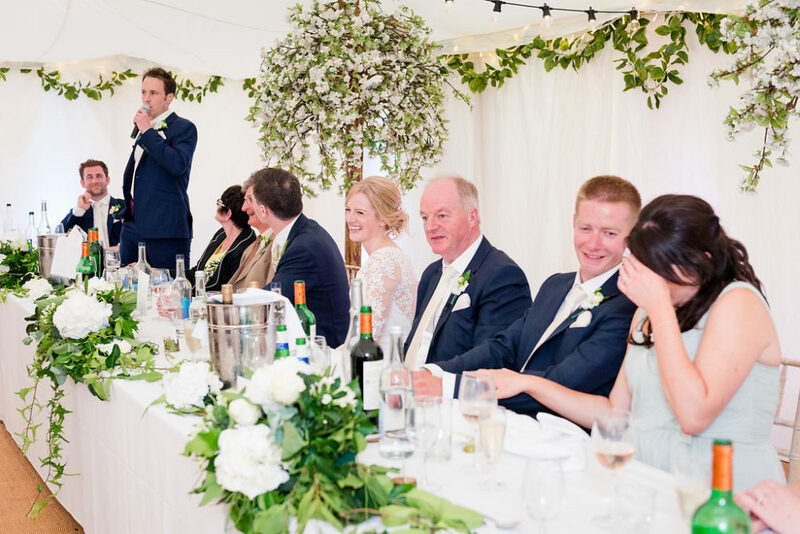 We wanted a simple and personal ceremony and most importantly – we wanted to keep it short so people could get on with the party. We had readings from John’s sister Catherine who shared a very entertaining and heartfelt poem from Roald Dahls Revolting Rhymes (Little Red Riding Hood) in memory of John’s beautiful mum. My best friend and maid of honour Louise shared an extract from Captain Corelli’s Mandolin. It meant so much for Louise to be a part of our ceremony as she was so supportive at every stage and the wedding wouldn’t have happened without her. I searched high and low for a wedding caterer with a difference. Food is a huge part of our life and I wanted something social and different. 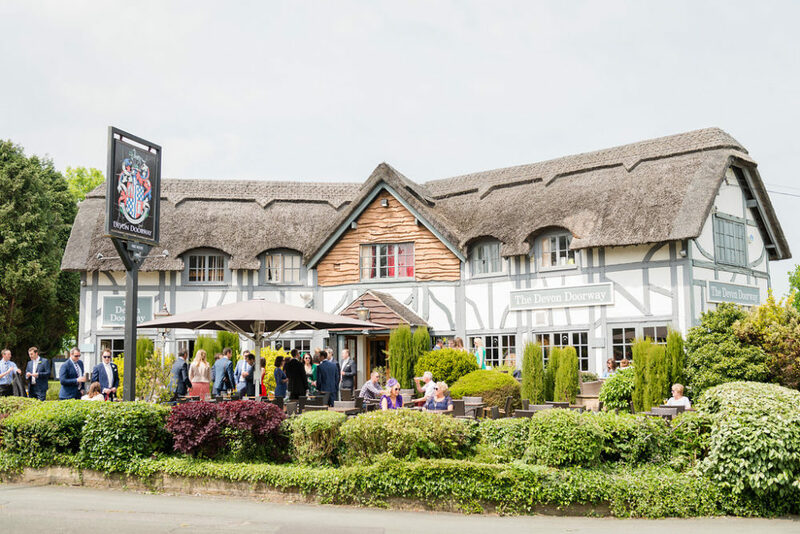 When I met Steven at Rhubarb and Custard (now Northern Fields) he had so much experience and ideas – I knew it was going to be special but I had absolutely no idea quite how good. The food has to be one of the stand outs from our wedding day. For canapés we decided on arancini, smoked salmon and cream cheese crackers. For the main event we had picnic sharing boards of hams, cheeses, olives, mini handmade pies and scotch eggs. This was followed by fillet steak with lots of sharing sides and then sharing pavlovas for desert. In the evening guests were topped-up with pulled pork buns. Steven also arranged the bar through his bar team – we had kegs of my dad’s favourite local beer and for the ladies an elderflower fizz. The best part was a margarita bar which really got the party started. This was even a surprise for me on the day. Stephen told me to leave it to him. He knew I wanted a naked wedding cake and boy did he deliver. Laura’s Little Bakery made our fab cake with red velvet, chocolate and vanilla layers and a toffee glaze. Decorated with flowers from Earth. We hired the very talented Manouchetones to play before, during and after the ceremony. Described as a gypsy jazz band their music was perfect for our outdoor setting – they were incredible. They were so flexible and could play whatever we wanted. I walked down the aisle to “Somewhere Over the Rainbow” which was very emotional as it was one of my late grandad’s (Poppa) favourite songs. After the ceremony, guests were invited on a tractor ride adventure to see the farm. For the evening we sourced the DJ from wedding jam – he was brilliant and had everyone up and dancing and was very happy to play a mix of our favourite tunes. The theme was a tale of two halves. My theme was white and green with trees – lots of trees! My gorgeous friend Stephanie created our wedding stationary with our personal logo which we used for invites, menus and order of service. For favours, we gave gin elderflower lollipops from Hollies Lollies and created labels using specially made stamps. A more subtle theme was the movie American Psycho. Not an obvious choice but it’s a bit of a running joke with John’s friends. Our table names were named after restaurants from the film and for our first dance we had a duo of Phil Collins songs – “In Too Deep” followed by “Susudio”. Turner and Moss took the beautiful photos. A lovely married couple, Amy and Andy were so relaxed and really put us at ease and through the whole process they paid attention to every detail. Professional and friendly and exactly what we were looking for I honestly couldn’t recommend them enough. We started off not sure if we wanted a video. The budget was already bulging and I thought perhaps this is one thing we can do without. I just knew though that the day was going to fly by so quickly and a film would be such a great way to remember all the special parts. We found Papertwin and wow they are good at what they do. They blended into the background through the day but captured all the best parts of the day. I’m a bit of a control freak and despite working a busy job I really wanted to plan all the little details for our big day. However, I quickly realised that with over 20 different suppliers I was going to need some help on the day. Charlotte at Charlotte Elise weddings was perfect for the job. She prepared everyone in advance to make sure everyone knew where they were to be and when, and that they had everything they needed. Everything ran smoothly on the day thanks to Charlotte – I think that may be my biggest tip for future brides!